Square and rectangle oilcloth tablecloths available in almost 50 prints. We also offer 100% cotton tablecloths in vintage print designs, below. Available in all of our fabric prints. 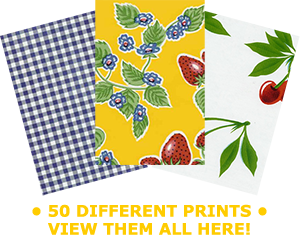 For oilcloth tablecloth orders of over 10 items, please contact us for approximate ship date. 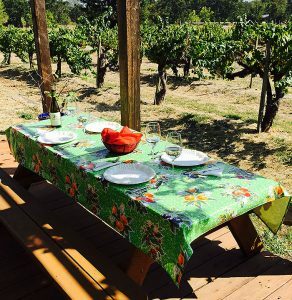 Round oilcloth tablecloths can take up to three weeks, subject to fabric availability. Let us know if you would like a whole in the center for your umbrella–just chose “Yes” for Add umbrella hole below if you wish. NOTE: We do not accept returns on tablecloths with hole cut out. Please do not ingest oilcloth: In compliance with Prop 65;	any product containing DEHP and sold in the state of California must have this warning: This product contains chemicals know to cause cancer and birth defects or other reproductive harm. Cottage Home Decor © 2008-2019. All rights reserved.